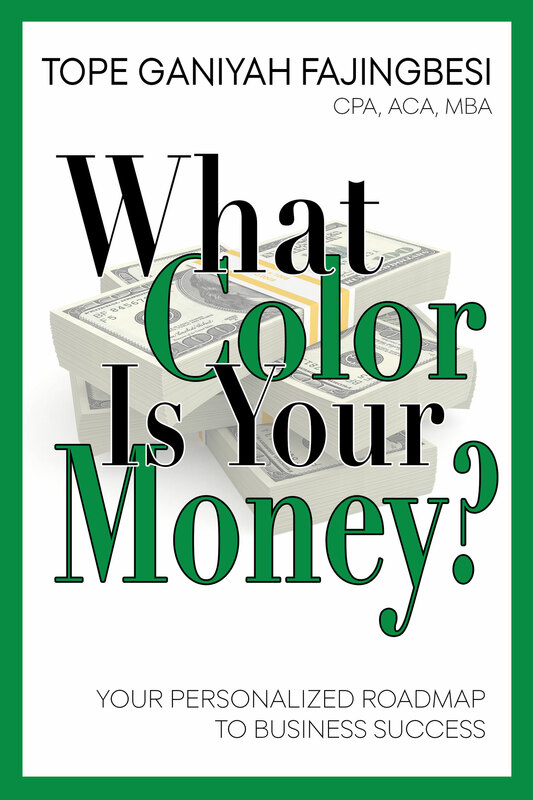 I am excited to announce the release of my first book titled – What Color is Your Money? WCYM explains financial management concepts and practices in plain and easy to understand language. I relate important financial management concepts – Budgeting, Internal Controls, Good Financial Reporting and Analysis (I call these BIGA) to everyday issues such as diet and exercise, travel and relationships, which business owners with non financial backgrounds can easily identify with. The goal of this book is to help business owners begin essential conversations about key financial matters, navigate often confusing financial terrain and breakdown concepts that hitherto seemed too complicated and scary for them. WCYM will be a relaxing therapy session for every stressed and anxious small business owner, a vote of confidence for the entrepreneur on the right path and an essential ingredient in the pantry of every aspiring entrepreneur worldwide. It is also an amazing resource for individuals considering entrepreneurship and business managers, who themselves are not yet entreprenuers but who are working hard for the growth of their employers businesses. WCYM is based on my fifteen years experience working with various business owners and managers from various backgrounds. WCYM provides answers to important questions business owners/managers frequently ask me and questions I know, from reviewing several hundreds of businesses, which every business owner should ask themselves, their accountants and their advisers. I hope you enjoy it and leave a message here with take aways!